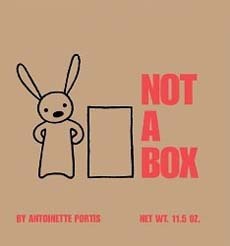 Not a Box tells the story of a rabbit who is asked what he's doing in or to a large box, and repeatedly responds that it's not a box, it's a spaceship, a race car, a mountain... This fun, clever book is a great anytime read, but would also be fun to read to children learning shapes. The premise is so simple and the illustrations so unadorned, you'll be shaking your head that it took this long for someone to come up with these creative books! Booklist likened it to Harold and the Purple Crayon, and it really is quite the same style--simple drawings that have a remarkable power to spark imagination. Each new incarnation follows the same format. A two page spread asks a question on the left side (ie: "Why are you sitting in a box?"). The right side then shows a simple line drawing of the rabbit and the box (properly oriented). 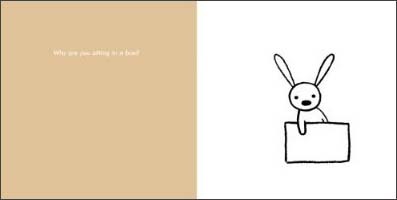 The next double page spread then gives the rabbit's response, always that it's not a just a box! The spread immediately following the one above has the rabbit in a race car. In a different incarnation (bottom pages at right), the rabbit is first shown standing behind the box but as the reader has come to expect, the rabbit sees the scenario as much more exciting than that, and in the next spread, sure enough, the box has been 'transformed' into a robot. This is probably something everyone did as a kid, but if you start the activity by reading Not a Box, students will really have their 'creative juices' flowing. And in first grade you learn shapes and contractions, so in addition to encouraging creativity, it teaches these subjects as well. Pre-make a book for each student using the mini-pages we have created for you. Small versions are shown at right; full size versions are located here. Copy the pages single sided, cut them out, put a piece of construction paper on the front and back to make a cover, and then staple it all together. The student writes the name of the shape on the blank line. (ie... "It's not a cone.") 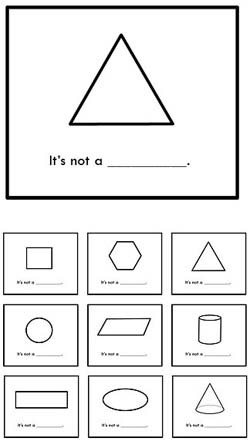 This is great for students learning basic shapes! 2) It can be a pain to make the pages line up so blank will be easier! One additional note: We thought about making the sentence "It's not just a _____" rather than stick to the exact wording of the book, just to avoid confusion. What do you think? Let us know if you prefer it in keeping with the book or would like us to add in the word just. 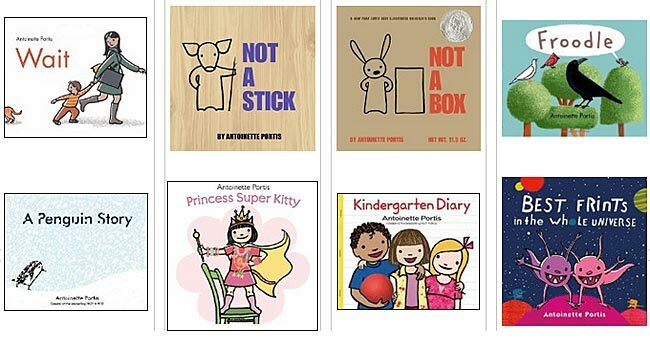 You may also want to check out other adorable books by Antoinette Portis. We LOVE her stuff! To learn more, click the book covers below or the link above.